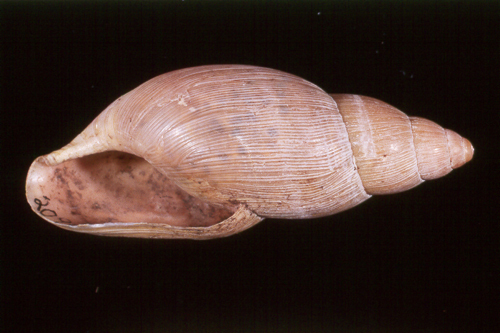 The carnivorous rosy wolfsnail Euglandina rosea was introduced to Indian and Pacific Ocean Islands from the 1950s onwards as a biological control agent for the giant African snail (Achatina fulica). E. rosea is not host specific meaning that native molluscs species are at risk of expatriatioin or even extinction if this mollusc-eating snail is introduced. Partulid tree snails of the French Polynesian Islands were particularly affected; having evolved separately from each other in isolated valleys, many Partulid tree snails have been lost and today almost all the survivors exist only in zoos. The shell is large (up to 76 mm in height, 27.5 mm in diameter), thick and has prominent growth lines (University of Florida 2009). The shape of the shell is fusiform with a narrow ovate-lunate aperture and a truncated columella; typically, the shell color is brownish-pink (University of Florida 2009). Adult Euglandina grow from about seven to 10 cm long (Clifford et al. 2003). Euglandina rosea is usually found singly in hardwood forests, roadsides and urban gardens in its native range in Florida (Hubricht 1985, University of Florida 2009). Euglandina rosea is a cross-fertilising egg-laying hermaphrodite. Chiu and Chou (1962, in Univeristy of Florida 2009) gave details of the biology of Euglandina in Taiwan. Individuals live up to 24 months. 25 to 35 eggs are laid in a shallow pocket in the soil. These hatch after 30 to 40 days. Euglandina rosea feeds on other snails and slugs, which they track down by following the slime trails left by their prey (Clifford et al. 2003). It appears to prefer smaller individuals, which it swallows whole, but will attack large snails by entering through the shell aperture. 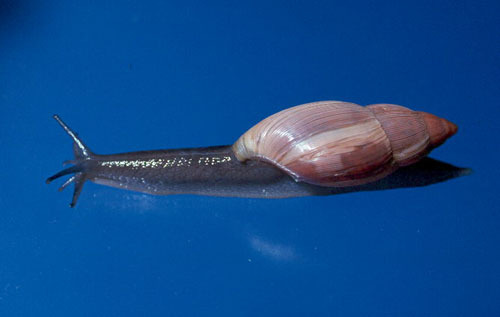 Recommended citation: Global Invasive Species Database (2019) Species profile: Euglandina rosea. Downloaded from http://www.iucngisd.org/gisd/species.php?sc=92 on 22-04-2019. For a detailed account of the environmental impacts of Euglandina rosea please read: Euglandina rosea (Rosy Wolfsnail) Management Information. The information in this document is summarised below. The future for some of French Polynesia’s partulids may not be as bleak as once thought; according to recent studies relatively high genetic diversity is represented among living taxa and it may still be possible to preserve a representative sub-sampling of Raiatea and Tahiti’s tree snail diversity (Lee et al. 2009; Ó Foighil 2009). Physical Control: The ultimate objective of captive breeding programs is the reintroduction of viable populations of endangered species into their natural habitats (Coote et al. 2004). Small exclosures have been built in Hawai‘I and on Moorea (French Polynesia) to protect native tree snails from attack by Euglandina rosea. Legislation: It is almost impossible to prevent the within-island spread of Euglandina in French Polynesia (Coote et al. 1999). Between-island spread of Euglandina should be prevented by legislation. The Marqueses Islands, the Southern Cooks and the Australs provide refuges for some of the remaining partulid species (Lee et al. 2007a) and should be kept Euglandina-free. E. rosea is now legally considered to be a noxious species in French Polynesia; the introduction of live specimens and their transport from one island to another is forbidden (Meyer 1998). Other: Since 1986 partulid snails have been the subject of an international breeding programme; the International Partula Conservation Programme manages a breeding programme for 25 species in 15 zoos worldwide. Introducing Society Island partulids to the Austral Islands that are free of the predator might ensure their long-term survival in the wild (Ó Foighil 2009). Coote & Loeve (2003) concluded that E. rosea was extinct in the wild on Huahine, strongly suggesting that the successful re-introduction of partulids into the wild on Huahine might be possible. Conservation actions in the wild may be limited to identifying and protecting populations of partulid snails that offer some possibility of persistence in the presence of Euglandina (Ó Foighil 2009). Based on laboratory behavioral studies of the effect of temperature on E. rosea movement, Gerlach (1994, in Ó Foighil 2009) hypothesised that an altitudinal refuge above 600 to 700 m would exist for Society Island partulids. Research and Knowledge: Further research into the biology of E. rosea, and particularly its population dynamics, needs to be carried out. There are no known natural predators, so a species-specific toxin in snail bait, as tested in Hawaii (M. G. Hadfield pers. comm., in Coote et al, 1999), could be a promising approach. A good relationship between the Pacific Island Land Snail Group (PILSG) and the French Polynesian government authorities has developed, and joint initiatives for conservation and research are being planned (Coote et al. 1999). Education and Knowledge: Despite the lack of evidence supporting Euglandina as a successful biological control agent and despite the abundant evidence of their negative predatory impact on native snail fauna, carnivorous snail introductions continue (Cowrie 1992). Clearly public education about the French Polynesia’s precious natural fauna and the dangers posed to such fauna by carnivorous biological control agents could help to reduce the likelihood of Euglandina being purposefully translocated to new islands. Local willingness and experience are already in place to conserve French Polynesia’s partulid snails (Coote & Loeve 2003). Informations on Euglandina rosea has been recorded for the following locations. Click on the name for additional informations. Carlton, J.T. & G.M. Ruiz. 2003. Invasive species: vectors and management strategies. Island Press. Clifford, K.T., L. Gross, K. Johnson, K.J. Martin, N. Shaheen & M.A. Harrington. 2003. Slime-Trail Tracking in the Predatory Snail, Euglandina rosea, Behavioral Neuroscience 117(5): 1086-1095. Coote, T., D. Clarke, C.S. Hickman, J. Murray & P. Pearce-Kelly. 2004. Experimental Release of Endemic Partula Species, Extinct in the Wild, into a Protected Area of Natural Habitat on Moorea, Pacific Science 58(3): 429-434. Gargominy, O. 2008. Beyond the alien invasion: a recently discovered radiation of Nesopupinae (Gastropods: Pulmonata: Vertiginidae) from the summits of Tahiti (Society Islands, French Polynesia), Journal of Conchology 39(5). Hadfield, M. G., Miller, S. E. and Carwile, A. H. 1993. The decimation of endemic Hawai�ian tree snails by alien predators. American Zoologist 33: 610-622. Murray, J., Murray, E., Johnson, M. S. and Clarke, B. 1988. 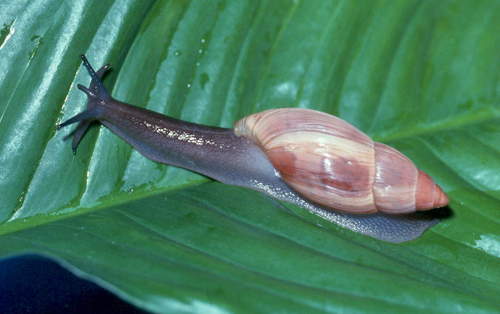 The extinction of Partula on Moorea. Pacific Science 42: 150-153. Coote, T. and Loeve, E. 2003. From 61 species to five: endemic tree snails of the Society Islands fall prey to an ill-judged biological control programme, Oryx 37(1): abstract. Coote, Trevor, Zoological Society of London. Field Report 2000/2001 unpub. Cowie, R.H. and Cook, R.P. 2001. Extinction or survival: partulid tree snails in American Samoa, Biodiversity and Conservation 10(2). Griffiths, O., Cook, A. and Wells, S. M. 1993. The diet of the carnivorous snail Euglandina rosea in Mauritius and its implications for threatened island gastropod faunas. Journal of Zoology 229: 79-89. Griffiths, O. Cook, A. and Wells, S.M. 1993. The diet of the introduced carnivorous snail Euglandina rosea in Mauritius and its implications for threatened island gastropod faunas, Journal of Zoology 229(1): abstract. Hopper, D.R. and Smith, B.D. 1992. Status of tree snails (Gastropoda: Partulidae) on Guam, with a resurvey of sites studied by H.E. Crampton in 1920, Pacific Science 46(1): abstract. Howarth, F.G. 1991. Environmental Impacts of Classical Biological Control, Annu. Rev. Entomol. 36. Kinzie, R.A. 1992. 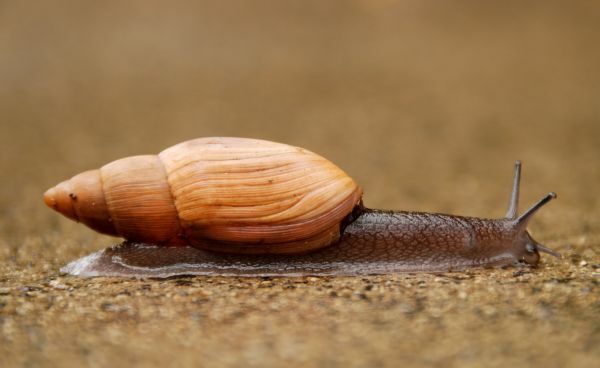 Predation by the introduced carnivorous snail Euglandina rosea (Ferussac) on endemic aquatic lymnaeid snails in Hawaii, Biological Conservation 60(3): abstract. Lee, T., J-Y. Meyer, J.B. Burch, P. Pearce-Kelly & D. O� Foighil. 2008. Not completely lost: two partulid tree snail species persist on the highest peak of Raiatea, French Polynesia, Fauna & Flora International, Oryx, 42(4): 615-619. Regnier, C., B. Fontaine & P. Bouchet. 2009. Not Knowing, Not Recording, Not Listing: Numerous Unnoticed Mollusk Extinctions, Conservation Biology 23(5): 1214 - 1221. Satoshi, C. 2003. Species Diversity and Conservation of Mandarina, an Endemic Land Snail of the Ogasawara Islands.